Like so many people in the DC universe, Lee is a metahuman, someone with abilities beyond the norm. His is a subtle gift: the ability to see through the eyes of anyone he touches. Lee uses his power to skim other people’s bank accounts, watching through his victims’ eyes as they type in PINs and passwords. When he realizes that Eli Cross, his latest embezzlee, is Gotham’s serial killer, Lee does his best to prevent the man from murdering his latest target. When that fails, he turns to the police and Batman for help, even though doing so means admitting what he can do. Better to risk having his own criminal activities exposed than to let a killer continue his spree. What Lee does not know is that Cross is not some lone loser; he is but one part of a lucrative business operation. A minor, replaceable part. Lee knows Eli’s name but Eli’s bosses know who Lee is. Cross will never have the chance to testify and if Cross’s bosses have anything to say about it, neither will Lee. Carson Clarke is a careful man. Even though the Batman and the police know he’s the man behind a stolen-baby-selling racket, they cannot prove it. All they can do is go after Clarke’s low-level agents, none of whom know anything damaging to Clarke. His minions face jail but Clarke is free to keep on profiting from the sale of stolen babies. Determined to put Clarke behind bars, Batman recruits Lee Hyland. At least, he tries to do so. Lee has vanished, recruited by Top Men from an undisclosed agency to join the fight against America’s enemies. Even if Batman could find Lee, the agency would never allow such a valuable asset back out into the wild. Not willingly, at any rate. Clarke is not as safe as he thinks. One of his subordinates has cracked under the pressure of his criminal activities and Batman is the least of Clarke’s problems. Dwayne McDuffie (1962 – 2011) co-founded Milestone Media, created Static Shock,and wrote and produced both Ben 10 and Justice League Unlimited. 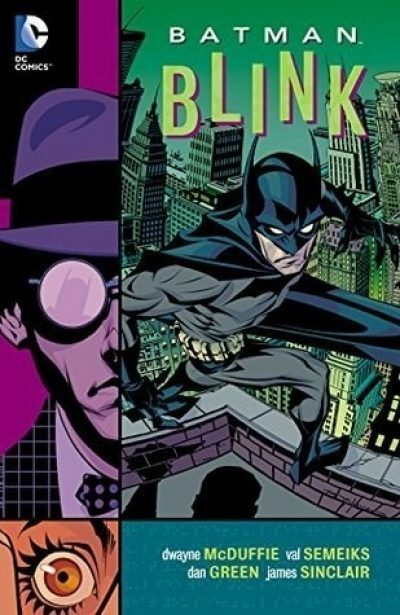 Unfortunately, my library does not have any of McDuffie’s Milestone works, so I have ended up reviewing his work-for-hire on DC Comic’s long-running property, Batman. Turned out that this was a bad choice. In many ways, characters like Batman are something of a blank slate. No doubt DC provides guidelines to their writers, but in the end, the character varies wildly from portrayal to portrayal. The 1930s had a grim vigilante, willing to kill. The 1940s and 1950s preferred a more affable version, properly deputized. The 1960s television version poked fun at itself, while the recent movies are earnestly humourless and grim. This version of Batman has no regard for civil liberties and casually tortures people — but he doesn’t kill. At least, he does not kill directly; it’s anyone’s guess as to whether the opponent he leaves dangling from a tree is retrieved before he dies of exposure. His excuse is that Gotham is filled with people who are even worse than he is and many of them are highly placed businessmen and politicians. If not for the brutal Bat, who knows what horrors would be unleashed on the small handful of innocent civilians who apparently cannot afford to move away from Gotham? One could argue, though, that if Batman and the cops just sat on their hands for a week or two, the only people left alive in Gotham would be the criminals, at which point the US could just built a giant wall around the place. It would not be the first time the US tried this and I hear giant walls are very popular with Americans these days. Because Legends of the Dark Knight is set early in Batman’s career, Duffie’s Batman is a loner. Aside from Commissioner Gordon and faithful butler/enabler Alfred Pennyworth, Batman has not yet recruited his army of assistants. Given his behaviour towards others in this series, it isn’t obvious that he would ever be able to do so; this Batman is basically a grumpy bully. One who is drawn by Dan Green, and Val Semeiks like he chugs steins of steroids every evening before bed. Perhaps because he’s written an unsympathetic Batman, McDuffie opts for wildly malevolent criminals: snuff film producers and baby-stealers, not to mention the occasional alphabet-soup agency gone rogue. Lee is an odd contrast to Batman: he’s a self-admitted criminal who uses his power to rob people. He’s also one of the few people in Gotham with an aversion to physical violence, a person who is horrified when he sees murder committed by the people whose eyes he borrows. Unlike the paranoid, secretive Batman, he’s willing to put the public good over protecting his secrets. Alas, Gotham citizens seemed doomed to either embrace violence or die. I cannot say I liked these stories at all — well, aside from the character of Lee. The art seems crude and the world it depicts even cruder. McDuffie’s creative choices seem … lazy and unsubtle. My own fault: I should have keep looking until I found a Static Shock collection.